I’ve recently been exploring another fishy route. I had been told about an old Japanese technique called Gyotaku, which translates as ‘fish rubbing’. Before the invention of photography, fisherman in Japan wanted a way to record the size of their catch. Their solution was to ink up the fish and print it. 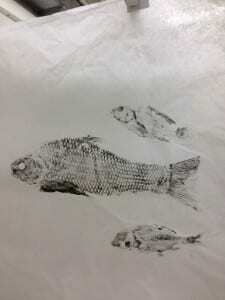 Working with James Keith, the printmaking technician at the UCL Slade School of Fine Art, I decided to see whether we could make our own fishy prints. We soon realised that we needed some more fish knowledge, so invited artist and fishmonger Sam Curtis to join us. The word/smell gradually spread until we had gathered a crew of five fish printers. Sam had brought a selection of beautiful and textured fish, which lay together in the printing workshop washed and ready to be inked. We had a selection of four inks to try out – a Chinese calligraphy ink, an acrylic ink, a cuttlefish/gum arabic ink bought from an art shop, and finally a squid ink from a fishmongers. Trying each in turn, it was the squid ink that produced the best results – creating deep black and detailed marks. Rather than being watery, as I had expected, squid ink has a thick jelly-like consistency that seems to lend itself to printing. Importantly, using squid ink would also mean that the fish were still edible after the printing process. The fish and the squid ink seemed to ‘get on’ with each other. We inked up each fish and then lay thin Japanese paper on top. 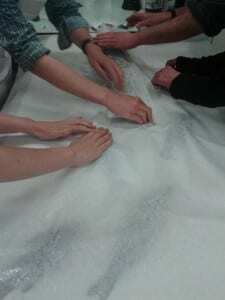 Now the rubbing began. Starting with the head of the fish, rub firmly but gently – circular motions with the palm of the hand or fingertips. This was a communal, collaborative fish rub – each of us had our own fish, whose inky outline was visible through the veil of paper. Once the rubbing was done, we removed the paper and the print was revealed. The fish appear almost like fossils, creatures caught in movement at a particular time. There’s a liveliness to the images, which is not just about how they look, it’s also about the process of making them – the direct touch and the gentle rub of five pairs of hands. Your article is very interesting. Are you planning any art workshops this half term? My 13 year old daughter & myself would be very interested.